Being a Hydrometry Officer is a funny role - the most interesting and satisfactory parts of the job are trying to measure the extremes of rainfall and water flowing down rivers. Sadly, this usually means that people and environments are suffering stress as a consequence of flooding. Never the less, it is a challenging and rewarding job. For most of the Christmas period my colleagues and I in Cumbria & Lancashire were chomping at the bit to offer our help and support to other parts of the country that were hit by some pretty devastating flooding. 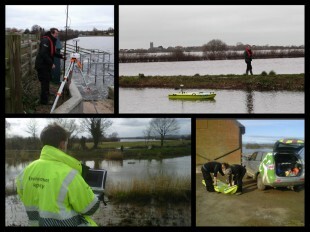 At the beginning of March, myself and three colleagues were asked to head down to the Bridgwater office in Somerset for a week to help the local Hydrometry team. It was a bit of a leap into the unknown as we had seen the terrible flooding in the media. The first half of the week coincided with some very high tides, which really affected our ability to pump at full capacity from the Levels, as the tidal rivers were already really full. The Hydrometry team in Bridgwater had been working flat-out on a 7 day week rota since Christmas ensuring that all of our telemetry systems, which monitor rainfall, water levels and water flows, remained functional. This allowed the incident managers to really understand where the water was and what action needed to be taken. A number of temporary telemetry sites were also set up, and the data they captured was fed straight up to the Cabinet Office Briefing Rooms (COBRA), to help the Government understand what was happening. Visiting the temporary sites was a real eye opener as it showed how badly communities were being affected, with many roads still flooded meaning lengthy detours were required just to travel a short distance. But as the week went on, it was pleasing to see that the efforts of the Environment Agency were starting to make a real difference, with more roads becoming passable with every new day. By the end of the first week, with the high tides diminishing, our roles switched from measuring water flows to surveying the rivers Tone and Parrett in preparation for planned dredging works. The information we provided is being used to plan and cost the dredging. The following week three of us again travelled back to Bridgwater to continue the survey work around the Burrowbridge area, a nice settled period of fine and dry weather was really making a difference to water levels in Somerset. Visiting Somerset was a real eye opener, both professionally and personally. I don’t think you can really comprehend flooding until you suffer from it, even seeing it first-hand doesn’t really give a good insight. Professionally though, it has been really good working with such a dedicated and knowledgeable group of Hydrometry officers from the opposite end of the country to me. It has also shown me how dedicated we all are to our jobs and how the work that hydrometry does really helps flooded communities wherever they are in the country. You can find out more about the Hydrometry & Telemetry work of Andrew Booth and his Environment Agency colleagues on Twitter.